Scribbly bark scribbles are the ultimate Rorschach Test of the bush! 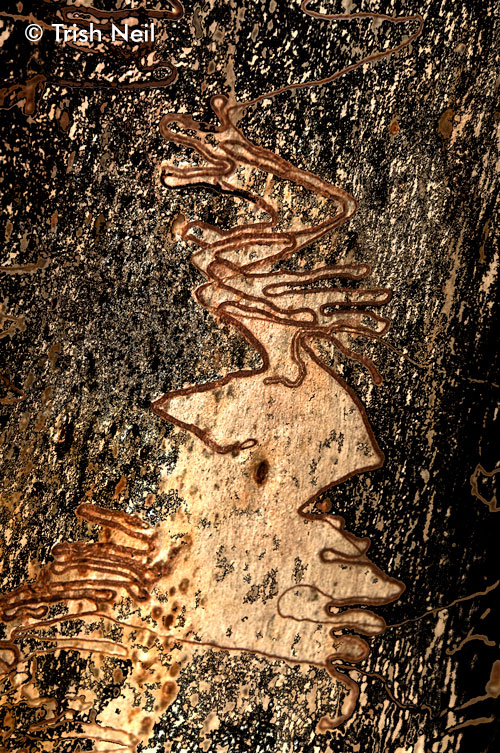 (For those unfortunates without ready access to the Australian bush, there are tiny insects which burrow under the bark of the Scribbly Gum eucalypts and leave these wonderful patterns. Each year the tree sheds most of its outer bark and reveals a new set of scribbles. Infinite variety!) With a little help from photoshop to emphasise what I see and produce something which looks rather like an etching, here is the first of a selection of Scribbles. You get an A++ for this one. I love, love, love this idea. Thanks for sharing. I am denifitely doing it. I will however, make photocopies of their scribbles, and save the originals. I have scribbles from one of my seven granddaughters, and two of my three great granddaughters. I had the idea of framing them in double sided acrylic, because they are on both sides of the paper, and that look is fantastic. This however, will be a gift to each of them, and now, thanks to you I will have a canvas for myself of their masterpieces, as I have so graciously labeled each. Thank you! Glad you enjoyed it, and that it has given you ideas to pursue yourself.